I would guess that since you are reading My Baking Addiction, you probably have some form of vanilla extract in your pantry. 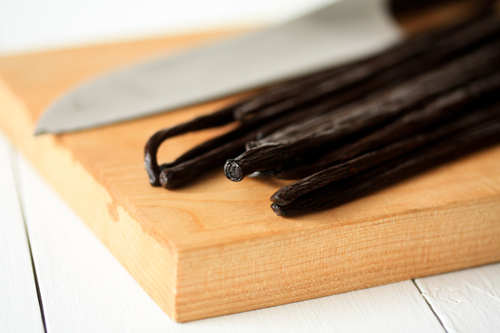 Some of you may use imitation vanilla, while others may fork over the money for higher quality pure vanilla extract. Regardless of your vanilla choice, I wanted to share an effortless “recipe” for pure vanilla extract using two easy ingredients; liquor and vanilla beans. I don’t expect everyone to use high quality products when baking or cooking because let’s be honest, we’re all on a budget and high quality almost ALWAYS signifies high prices. Nevertheless, vanilla is one of those ingredients that I never skimp on. The difference between pure vanilla and imitation vanilla is simple. Pure vanilla extract is made from vanilla beans, while imitation vanilla utilizes imitation flavors to impart that vanilla goodness; the difference in flavors truly cannot be compared. If you have ever purchased vanilla beans from you local grocery store, you know they come in a glass bottle and retail anywhere from $8-10 for one dry bean. Personally, I refuse to pay such a ridiculous price for such low quality ingredient. In the past, when friends of mine have gone on a Mexican fiesta, I have pleaded with them to return back to Ohio with some vanilla stashed in their luggage. Last year, Rob, from Beanilla, sent me a variety of high quality beans from all over the world, including cherished Mexican Vanilla Beans , and I have not looked back since. Although, I love the Mexican Vanilla Beans, I have thoroughly enjoyed experimenting with the numerous varieties of beans that Beanilla has to offer. Much like wine preferences, every baker’s tastes will vary with their choice of vanilla. I now make my own vanilla extract to use in all of my baked goods and could not be happier with the results. Although this may seem an intimidating and unnecessary process, I can tell you that the results are unrivaled. Other than having to go out and purchase the alcohol, Beanilla provides everything you will need to embark on this simple task, down to the glass bottles for making and storing the extract. Be sure to come back later this week for some fun gift ideas including adorable labels that can be personalized for your favorite baker. Step One: Gather your ingredients. Step Two: Use a knife to split the vanilla beans. Step Three: Place beans in bottle and cover with liquor. Final product after 6 weeks. 1. Use a knife to spilt the bean in half, leave about ½ inch at each end intact. 2. 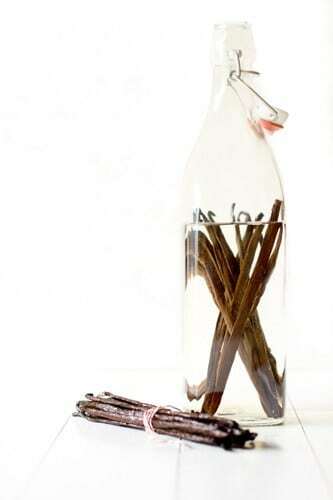 Put your vanilla beans in your glass bottle or jar and cover with vodka. 3. Close jar or bottle and store in a cool, dry place for at least 6-8 weeks. Give the bottle a shake every week or so. As you use the vanilla, simply add in more liquor to replace what you have used. This is a great idea and seems like such a simple project. I absolutely LOVE the bottle that you selected to store your extract in – Beanilla has such a fantastic selection – I can’t wait to get started. I agree that the finished extract would make a great gift – especially a hostess gift for the holidays! Thanks for the gorgeous photos and suggestions! 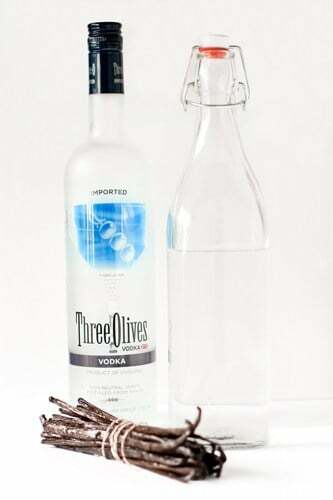 Maybe it’s ghetto, but for my home uses, I made vodka vanilla 2 years ago, and just dropped the opened vanilla beans directly into the vodka bottle. It’s lasted me forever. I’m going to try using Bourbon next, as I hear that’s spectacular as well. How would vanilla extract be done in an Halal fashion . No alcohol. Much appreciated. Good question…I will have to do some research on this one. i can’t wait for your research result for Halal-non-alcohol vanilla extract. as moslem we’re really need that. thanks for your attention. Is there a way to make it without Alcohol?! I would really appreciate that recipe? I am not aware of a way to make homemade extract without using alcohol. Sorry I am not more of a help. I third that.. I am trying to find some other recipes that call for alcohol that have a replacement.. I don’t allow alcohol in my house (my ex would find it and drink it).. So any ideas as replacements would be greatly appreciated!!! I have a friend who only eats raw foods (her website is: http://www.livingrawbygrace.com/) and she makes her own vanilla extract by pulverizing vanilla beans and water. It’s delicious and potent, but won’t stay preserved as long as true vanilla extract (made with alcohol) would. It is totally worth it! The flavor make a big difference I think. Madagascar is my bean of choice. I’ve been purchasing from Beanilla for a couple years and am never disappointed, it helps I live in the same state cause I get them faster! Also, a bottle of extract can be used as a decorating piece. I love looking at mine. I’ve never tried making my own before. I do however have some beans that I’ve been wondering what to do with. I think I’ll give this a whirl! I’m doing the same…last year I did cranberry liqueur for gifts; this year hope everyone loves the pretty bottled vanilla bean extract. It’s so easy! Mine is not ready yet but I can’t wait to try it. It is; it’s almost as easy as this and it’s soooo pretty! Those leftover bits of cranberry…think vanilla ice cream with some cranberry fruit and liqueur. Very festive! This would make for the perfect gift! I love homemade vanilla! When I went to Hawaii I visited a vanilla plantation and brought home some beans to make extract. So delicious! I’ve been wanting to try this for a while…my only question is how often do you have to change out the vanilla beans? Once my bottle gets about half empty, I simply top it off with more liquor and add in a few more beans. Beautiful photos! Once you make your own extract, it’s hard to go back!! Thanks for sharing! I’m so trying this out! In Denmark we use vanilla infused sugar instead of Vanilla Extract, this can be made without alcohol. Compared to vanilla extract, I would doublethe amount. 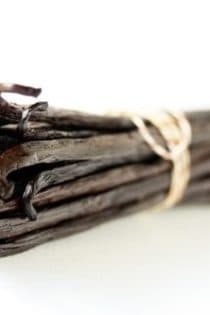 I just bought 40 vanilla beans–I got a super good deal–just seven bucks! Can you use just the vanilla bean in a recipe instead of making the extract?? You can certainly use the beans inside of the vanilla beans in recipes. They are great in creme brulee, ice cream and frosting. I was wondering where you found the vanilla beans? Not a silly question at all! Once my bottle get about half empty, I add in more vodka and a few more beans. Super easy! Love this and what beautiful pics! I keep meaning to give this a try sometime. Thanks for the great photos – very inspiring. Love the bottle you chose too. It is so beautiful… you make it seem like a work or art! I friend just gave me some homemade vanilla and I love it… now if I could just find inexpensive vanilla beans I would be all set! What a great idea! I need to give this a try, thanks for the recipe! I LOVE these photos – and the simplicity and deliciousness of this project. My sister in law made mini bottles of vanilla extract as wedding favors last fall and they turned out fabulously – delicious and adorable! I wsn’t aware that you could reuse the beans (with a few additional ones as you said). Thannks so much for the info! I am just now needing to make more ( I stole plenty of my fellow family members bottles) and you post will come in handy. How beautiful! 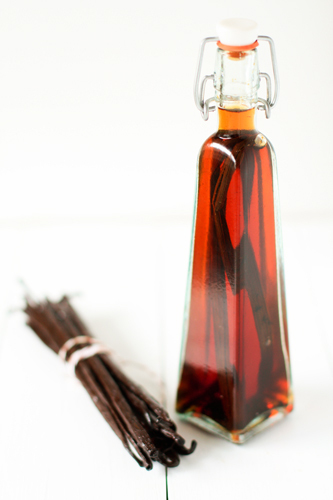 I never knew how to make my own vanilla extract! So cool, thanks! This is great, Jamie! I just got some vanilla beans from Beanilla, too and they are GORGEOUS!!! I’m planning to make some vanilla extract, so this is perfect! Thank you! i have been wanting to do this for a long time. this is so easy. and…i have lots of vanilla beans on hand right now. lovely photos! This is so awesome!!!! This would make such a lovely gift. Thank you for this. I love the homemade vanilla route. Works so well for gifts and for baking in my own home. I really think I would love making this. Thanks for the inspiration… and Happy Thanksgiving! Do you notice an alchol flavor in your cooking and baking? not a big fan of that flavor but would love to try to make homemade vanilla! I saw a similar recipe for homemade vanilla extract last year on another blog. I ordered vanilla beans, made a visit to the local ABC store & have never bought another bottle of extract since! I have a jar of extract made with vodka & another jar made with Jack Daniel’s whiskey bourbon. Both are wonderful to have when I’m baking & they’re both so easy to make. 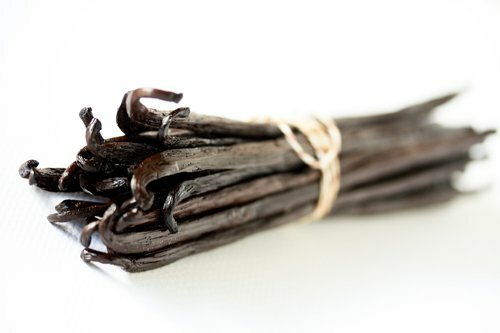 You can actually get some really fragrant Madagascar Vanilla Beans for a really good price online. I get 7 long beans for $7.95, and it’s free shipping. What’s funny is when I picked up the mailing envelope, I had no idea what it was because I forgot I had ordered it, and before I opened it I was hit with the vanilla aroma and I was like oooooo VANILLA!!! You can get them on Amazon, and there’s a reason there’s 52 reviews and it’s 5/5 stars! I can’t wait to make my own vanilla extract! It will be a lot cheaper making it homemade, not to mention BETTER! Thanks for the awesome recipe! So I’m new to his blog and late to this post. I love vanilla, but not big on brands/flavors of alcohol. (I just can’t imagine that beer would be appropriate for this.) Can anyone try to comment on the flavor differences and uses for say rum over bourbon or vodka? What should I look for when I go shopping in the booze aisle? It has more choices than the cold cereal section and I’m clueless. Thank you for your suggestions. I have a question…I’ve made vanilla like this before (using beans from Whole Foods and vodka) but when I used it in my baking recipes it really altered the taste, it’s like it was too strong or bitter or something. I went back to using store-bought because the homemade seemed to ruin everything I made. Any ideas as to what went wrong? I have used homemade vanilla extract for a long time and never noticed a bitter flavor. I really have no clue what would have caused it to be bitter. My best guess would be the beans themselves. My Vanilla Beans and Bottle just got here today and I was super excited to finally get them and be able to try out the homemade extract!!! :) :) Going to buy a pretty jar and try the homemade vanilla sugar as well.. You can never have tooooooo much vanilla flavor! :) Thanks for the great ideas!! I love your blog! I’ve been making my own for years now. Last time I went to buy some real extract I almost fainted at the price and figured that making t myself would be soo much more cost effective which it has turned out to be. When I went to culinary school the Chef that ran the place made his own since he went threw it soo quickly. He passed along the recipe to me. Sounds yummy — with the holidays coming up — vanilla flavored vodka in eggnog would be really yummy —- will have to find some vanilla beans to try this! As I type this, I have a bottle of vanilla extract deep in the bowels of my cupboards preparing for greatness. I can’t WAIT until March 13! (8 weeks) It’s amazing seeing the changes on a weekly basis. I would love to make these as Christmas gifts, but wanted to try on my own first. There’s even a website to make your own labels and I plan to purchase some Madagascar beand from Beanilla VERY soon. Check out Specialty Bottle for the 4 oz Amber Boston Round bottles. I make my vanilla with Pinacle Whipped Cream Vodka. It’s amazing! I’m really enjoying your website– so beautiful and informative! A quick question (and I hope it hasn’t been asked already, as I admit to scrolling through the bottom half of the comments): do you eventually take the oldest/older beans out? They must eventually lose their flavour (or perhaps their structural integrity, immersed in liquid for so long)… do you take some out when you put new ones in? I shouldn’t have hit submit! Another question: does the 6-8 weeks in your recipe refer to the time it takes before you can use your homemade vanilla? Thanks! You’ll want to let it sit for at least 6-8 weeks before using. The longer it sits, the better. I just give my bottles a shake every so often. Hope this helps. Beautiful photos! Cost Plus World Market sells packs of 2 vanilla beans for $2.99, and they also sell some really cute small glass jars. I know what I’ll be giving out as Christmas gifts this year — thanks for this tutorial, glad I found it in time to let the jars sit for a couple of months before Christmas! i was going to try to be a head for Christmas next year, but it sounds like it is too early to make my vanilla to hand out now, right? No, it is not too early. You can start making your extract now. Thanks for stopping by and have a great day! How soon can you use the extract after topping off? And do you get consistent strength whenever you add beans and top off? Thanks for sharing this, it’s lovely to have your own vanilla extract! I love your blog and beanilla’s too! I feel like ordering every type of bean! I’ve usually waited about a week after topping off, but shaking the container seems to help with making sure the strength is consistent. Use a good bourbon or rum last for years. Ask the people who work at the store. Watch the price. I do mine a year.barcady gold is good, I’m not a drinker so don’t want something that tast like rubbing akahol. My vanilla has been brewing for 6 weeks now, but it looks so grainy in the jars. I have 6 pints in hopes to give some as Christmas gifts to my neighbors. Do I have to strain it before transferring to the smaller bottles? My recipe said to scrape the seeds, but to put them in the jar with the beans. I bought Madagascar Beans. You can strain it through cheesecloth to get rid of the grainy bits. No worries, nothing is wrong with the extract! Thanks for stopping by! I have been making homemade Vanilla for my daughters and myself for a year now. I have wanted to try more beans but now I have different beans and I’m not sure how to store them. .. I have one of those nice glass containers from Beanella but I don’t want to mix them up… If anyone has any ideas, please let me know. I love looking at them..
this year I have mixed Tahitian Beans with the Madagascar beans.. so we’ll see how that turns out. .
Let us know how the mixture of vanilla beans turns out! Thanks for stopping by. Thank you so much. I am glad I chose your site to get your carmel sauce recipe. The homemade vanilla extract was an added bonus. I went right out to the local grocery, they did not carry vanilla beans. However, there was a product from simplify that had a glass jar similar to yours with 3 beans in it. A bit pricey, and not enough beans for my taste. I am sick to death of paying high prices for good vanilla and end up using way more than I should of the imitation. So I ordered more beans online and headed for the liquor store to get some vodka. To wrap this up, my bottle is in the cuboard and I just can not wait to try this. 6 to 8 weeks will put me at fall baking and I will be ready. Thanks again.